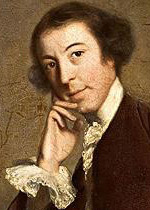 Horace Walpole (1717-97), 4th Earl of Orford, was the son of the Whig Prime Minister, Robert Walpole. In 1747 he moved to Strawberry Hill in Twickenham, which he transformed into his "little Gothic castle". He was at the centre of literary and political society and an arbiter of taste. He is remembered for his witty letters to a wide circle of friends.